Prehistoric Stonehenge on the Salisbury Plain in England is probably the best known and most studied megalithic structure anywhere in the world, yet its original purpose is still unclear. Even the celebrated summer solstice sunrise significance is in doubt, Stonehenge may actually have been built to mark the winter solstice sunset. 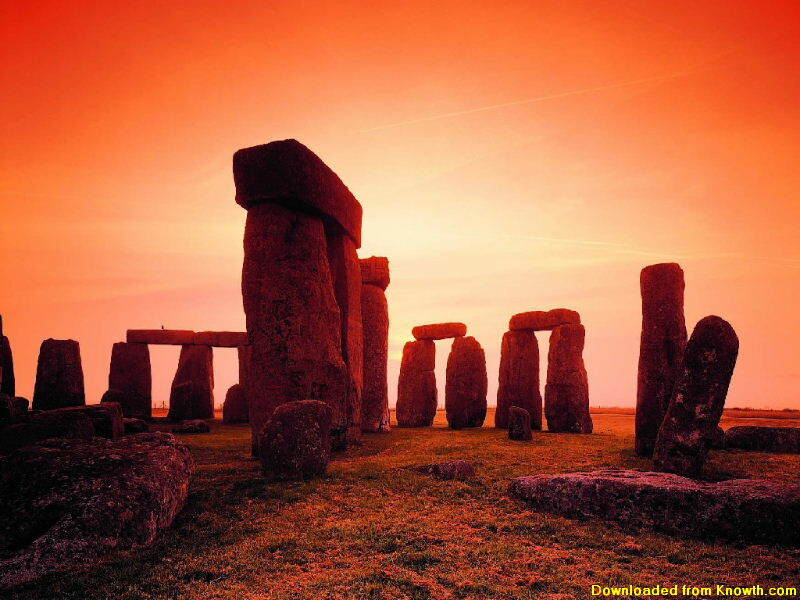 The winter solstice would have been of much greater importance to the builders of Stonehenge, early farming communities who depended on the return of longer and warmer days to grow their crops. In Ireland the chamber of the mound at Newgrange is illuminated by the winter solstice sunrise. A shaft of sunlight shines through the roof box over the entrance and penetrates the passage to light up the chamber. At the nearby mound at Dowth the winter solstice sunset illuminates one of the chambers. Whatever the original purpose of Stonehenge, it certainly would have been a magnificent ancient temple, a place of spiritual, religious and ceremonial importance. Building activity at Stonehenge began about 3000 BC (over 5000 years ago) with the construction of a circular ditch enclosing timber posts. The timber posts may have supported timber lintels in a wooden henge structure. About 500 years later (2500 BC) two concentric stone circles were erected using about 60 blocks of bluestone, the stones weighing up to 4 ton were transported from Carn Menyn in the Prescelly Mountains over a 100 miles away. The bluestones were probably transported by sea and river over a number of years. Some years later the builders started using much bigger sarsen stones (a type of sandstone), weighing up to 50 ton each they were transported about 20 miles from the Marlborough Downs. Over a number of years a circle of 30 sarsen stones capped by a ring of sarsen lintels were erected. Within the circle five sarsen trilithons (two upright stones with a single lintel stone) were constructed in a U shape. At some stage the original bluestone stone circles were dismantled and re-erected following the pattern of the sarsen stones, a circle and a U shape. AboutStonehenge.info by Christiaan Stoudt is an excellent Stonehenge resource, covering the construction periods, Stonehenge legends, Archaeoastronomy and general tourist information. Stonehenge by English Heritage, the official Stonehenge website providing visitor information and a history of Stonehenge. Solving Stonehenge - The New Key to an Ancient Enigma. A completely new and convincing solution to the key puzzles of Stonehenge by Anthony Johnson, an experienced archaeologist based in Oxford, England. Stonehenge image sized for use as background wallpaper.